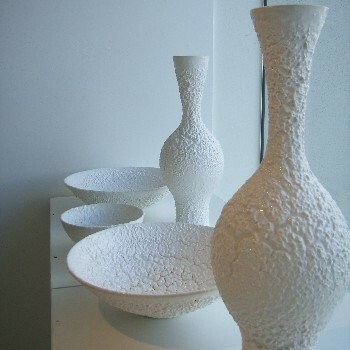 John Parker is considered one of the leading studio potters in New Zealand. His long involvement with the New Zealand ceramics community formally began with his completion of a Master of Arts (ceramics) at the Royal College in London. He is one of the few local potters to hold formal training in his area, and this period - during which he was heavily influenced by European artists Lucie Rie and Hans Coper - gave a strong foundation for the disciplined and intelligent style for which he is now recognised. Parker has often engaged with pointed intellectual arguments in the creation of his work - most obviously the debate surrounding the handmade; craft versus production in ceramics. 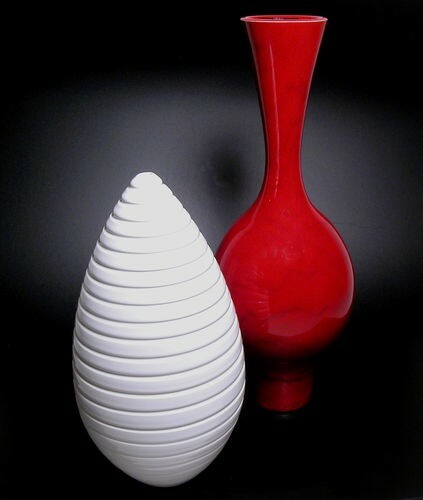 His work draws a parallel with a coveted series of early New Zealand production ceramics from manufacturer Crown Lynn. Crown Lynn took the unusual step at the time of employing artisans and designers to create their range of mass produced domestic ceramics. The examination of this handmade/mass produced format led Parker to investigate it in his work. He strives to create the perfect shape, decorated with geometric grooves applied with flawless precision. These objects are devoid of the 'maker’s touch' which identifies most studio ceramics, yet they are handmade with every detail and mark attended to by the artist. An intense strength resides in the simplicity and austerity of Parker’s work. Teasing out notions of functionalism, forms are pared down to a minimum and expression is reduced to the absolute essentials - there is no decoration, unnecessary embellishments or exaggerations to the form; monochromatic densely coloured glazes focus the eye on the pure form. Parker’s work is avidly collected within New Zealand and is held in major public and private collections. This talented man is also recognised as New Zealand’s leading theatre designer and is well known as a film critic and writer.